Purchase a brand new set of BC Racing BR Series Coilovers for your VW Golf VI and SAVE MONEY at ModBargains.com! Our Modification Experts are ready to help at 714-582-3330. 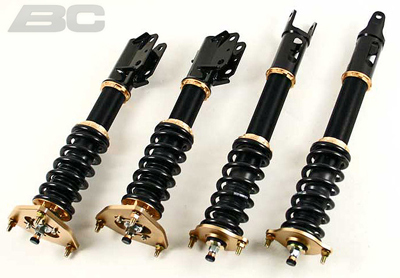 The BR Series Coilovers from BC Racing are the ultimate in street and track performance suspension. Their easily adjustable ride height, compression and rebound allow you to maximize the performance of your vehicle in just about any driving situation. And if you want, the BR Series Coilovers can give you a pretty lengthy drop if you're going for the hellaflush or low-rider look, but they can also give you a more functional ride height if you want to rip around on the track. 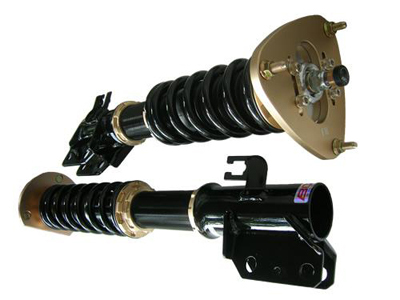 Not only are these coilovers great in their performance aspects, but in their durability and aesthetic beauty. They are mostly made from aluminum and steel from the highest tiers of quality and strength in order to give you the longevity that you need for your coilovers to last in extreme driving conditions. The black chromed steel dampers, anodized aluminum components, and electrically treated steel lower mounts give you the overall aftermarket suspension experience that you expect out of your coilovers. So if you're ready to make an order for a set of BR Series BC Racing Coilovers, give ModBargains a call at 714-582-3330 to speak with one of our Modification Experts and get the exact parts that you need. Our mission is to share our expertise, experience and enthusiasm to make the world a better place for car enthusiasts.